a, b, and c are BindingDecls, whose bindings are the expressions x, x, and x respectively, where x is the implicit DecompositionDecl of type 'int (&)'. Definition at line 3802 of file DeclCXX.h. Definition at line 3838 of file DeclCXX.h. Definition at line 3839 of file DeclCXX.h. Definition at line 2866 of file DeclCXX.cpp. Definition at line 2871 of file DeclCXX.cpp. Get the expression to which this declaration is bound. This may be null in two different cases: while parsing the initializer for the decomposition declaration, and when the initializer is type-dependent. Definition at line 3824 of file DeclCXX.h. Referenced by clang::ASTDeclWriter::VisitBindingDecl(), and clang::ASTNodeTraverser< Derived, NodeDelegateType >::VisitBindingDecl(). Only present for user-defined bindings for tuple-like types. Definition at line 2875 of file DeclCXX.cpp. 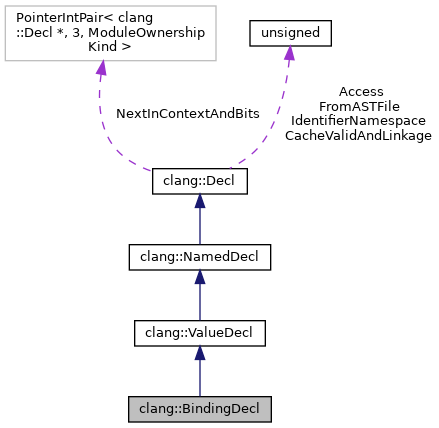 Set the binding for this BindingDecl, along with its declared type (which should be a possibly-cv-qualified form of the type of the binding, or a reference to such a type). Definition at line 3833 of file DeclCXX.h. Definition at line 3815 of file DeclCXX.h.